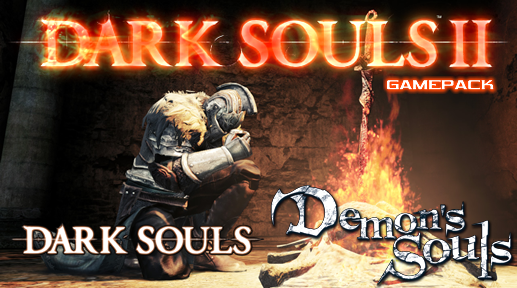 The Souls Series Gamepack for Titan One was especially made for Dark Souls II, Dark Souls and Demon's Soul. It has 6 distinct MODS including Fast Attack Combo, Strong Attack Combo, Reliable Guard Break and Jump Attack, Auto Two-Handed Jump Attack, Quick Quit, God of War Button Layout and Auto dual weapon wielding swing. Player LED 1: Controller in regular mode, Souls MODS are disabled. Player LED 4: MODS are enabled, check configuration section below to activate/deactivate individual MODS. Perform the Guard Break and Jump Attack actions reliably by holding down the handhold toggle button (TRIANGLE/Y) plus fast attack (R1/RB) for Guard Break or strong attack (R2/RT) for Jump Attack. The handhold toggle action (one/two handed) is executed normally when the correspondent button is pressed and released quickly. Assigns to L3/LS button to execute the sequence of (1) hold the weapon with two hands; (2) perform jump attack; (3) go back to holding the weapon in one hand. To use this MOD in Dark Souls II configure the jump action to the same button of roll action, as it is in the original Dark Souls. If activated a quick tap on PS/XBox button will execute the sequence to quit the game as fast as possible: (1) open the game menu; (2) go to last menu item; (3) select quit option; (4) confirm YES. The quit sequence is the same for Demon's Souls and Dark Souls. However, in Dark Souls II the sequence is different and the game recalls the last selected menu. For the Quick Quick MOD work in Dark Souls II the last selected menu should always be the Equipment menu. The God of War layout MOD remaps some buttons to mimic the God of War game controls. This layout has the advantage to use sprint, roll and jump without loose control of the camera. Automatic perform left and right swings when dual wielding weapons. If enabled the mod is activated by holding down the left weapon attack button. The timing between swings can be adjustable.